So following up on my post on the types of unemployment, when unemployment is high, how do we know if it’s due to structural or cyclical causes? The answer is important because it tells us what kind of policy actions to take. Do we need stimulus? (addresses cyclical), or do we need job-retraining, relocation, and education? (targets structural). There is no clear cut way to tell how much of each type exists. For example, suppose unemployment is 9%, much as it is today. Let’s assume that this is a seasonally adjusted number, so we can assume that none of the 9% represents seasonal. Let’s further assume, just for the sake of arguement, that 5% points of the 9 points represent frictional unemployment. I should note that this is a somewhat controversial point. I do not personally think that frictional is in fact that high nor that it we cannot get below that point. Personally I don’t see why frictional should be greater than 2-3%. My views on this are heavily influenced by Bill Mitchell and the MMT people. But since mainstream economics since Milton Friedman has defined it so, let’s accept frictional unemployment as being 5% just for the sake of this argument. That means there’s another 4% points of the 9 points that must be either structural or cyclical. How can we tell the difference? There’s no clear-cut way to tell as in doing some direct survey. Instead we need to look at some indirect indicators. Two of the more indicators we could look at are: the job seekers to job openings ratio and unemployment by industry or state. If our high unemployment is primarily due to structural factors then we should see a low ratio of job seekers to open jobs, and we should see wide differences in unemployment by industry or geography. If we see low ratio of job seekers to job openings, then that means there are jobs in aggregate but apparently those seekers (unemployed) are unqualified. If we see wide differences in unemployment by industry or geography, it indicates again that jobs exist but they aren’t where the workers are. On the other hand if the seeker-openings ratio is high, then that means there just aren’t enough jobs period – workers outnumber jobs. 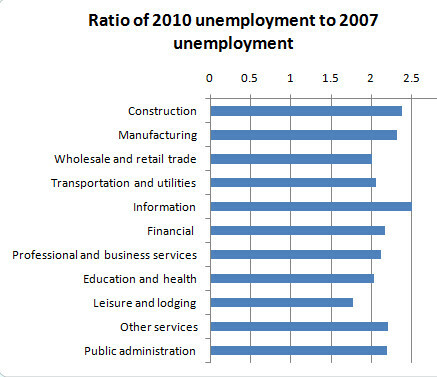 If unemployment is high across all industries and locations, then again there is no unsatisfied sector. 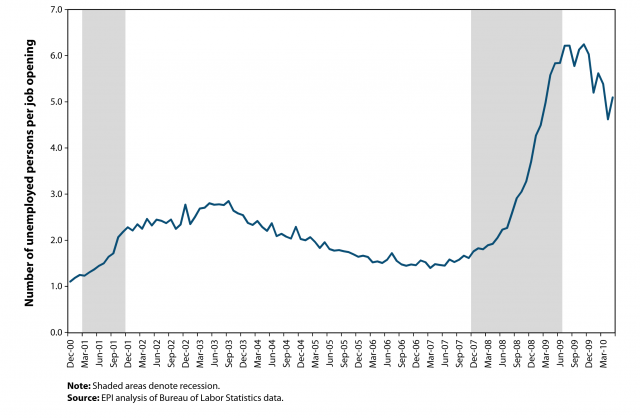 There is no structural unemployment. See the structural shift? Neither do I. 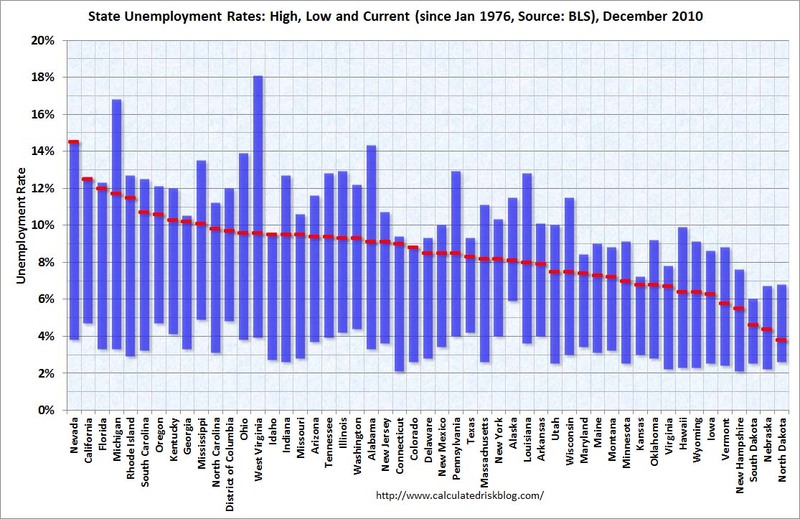 As others have noted, basically unemployment doubled for every industry, every occupation, every state. Where are the sectors/occupations/regions gaining jobs? Nowhere to be found. There’s nothing structural about it. Still no mismatch. Yes, there are three states under 5% and two more under 6%, but these states are the Dakotas, Nebraska, New Hampshire and Vermont. Relatively speaking, nobody lives there. So overall this means it’s not structural unemployment that is keeping unemployment high. It’s cyclical unemployment. That means the route to lower unemployment is more stimulus, not austerity. Better yet, a jobs guarantee program could work very effectively.